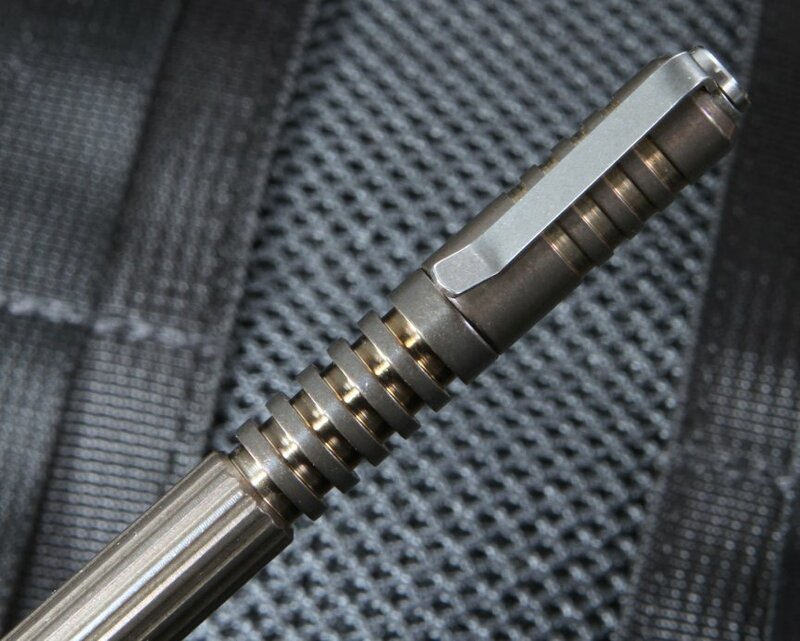 The Rick Hinderer Investigator Pen is the kind of tough, state-of-the-art compact tactical pen you expect from a high-end, CNC and CAD_CAM-designed product. Enjoy the pen's ergonomic feel as you revel in its inherent protection. With black bold ink and available Fisher Space Pen full size refills (pn# SPR4B),this rugged tactical device is not only a smooth writing instrument, but a close-quarters tactical protection piece as well. It is machined to withstand blunt force easily, and ergonomically designed to provide solid grip as well as functionality. Everyday carry is easy when you have a practical, light-weight, yet strong, compact device. The pocket clip allows you to easily carry the pen in a shirt or pants pocket and the overall size works great for small notebooks. You can screw mount the cap on back of the pen when writing. Rick Hinderer EDC Pens, cap on, are 4 1/4" long, 3/8" wide, and are only one ounce, but have the fierce ruggedness you need in close-quarter altercations. 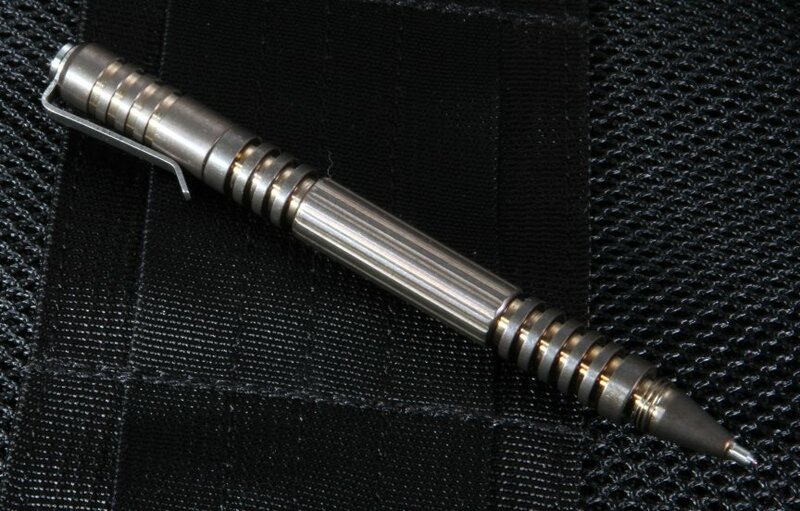 Available in copper, brass, titanium, hard anodized aluminum, stainless steel, (this one is the bronze anodized aerospace grade titanium). Titanium has an outstanding strength to weight ratio that is a terrific choice for edc carry. 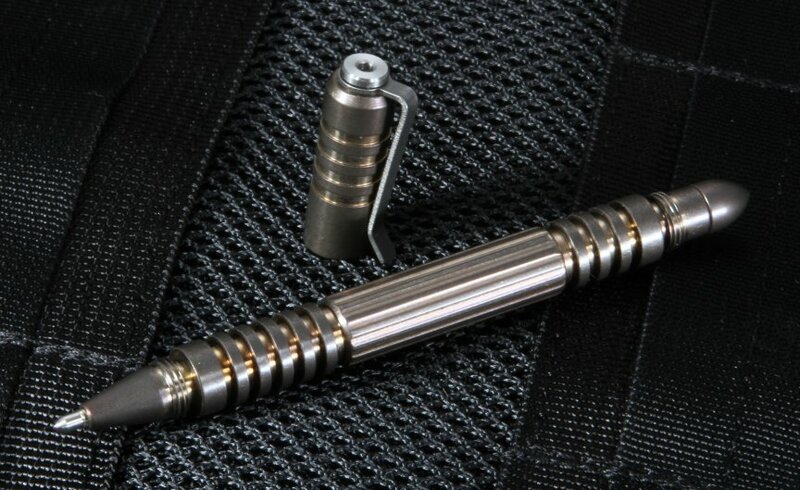 Looks match performance; compact pen has grooves that meet your finger grip for best protection and quick defense. 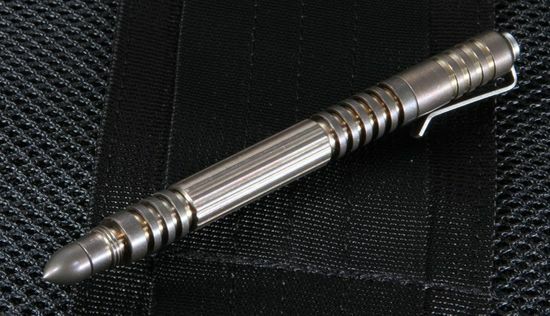 This pen is proudly all American made and feature a titanium bullet tip. With fast, everyday shipping, you are assured a quick product delivery of your Hinderer everyday carry writing pen. We are an authorized dealer, with no restocking fee. You can order our curated merchandise with confidence. Our business model is as rugged and reliable as the merchandise we offer, and we are here to serve those who expect the best in their tools.